Back to blogging after busy days with school break followed by a short wonderful trip to Abudabhi. Missed this space and hope you all too missed me! We came back a week before and the schools were to reopen next day itself. This time with younger one's entry to kindergarten section, we were excited but he seemed to be bit anxious. We had to spend more time talking to him about his school, teachers, singing nursery rhymes, watching educational videos, etc. with an attempt to make him feel comfortable about the new chapter in his life. We took him for shopping school items such as bag, tiffin box, water bottle, stationary, etc and repeated the same exercise as we had done with our elder one .. involving them while selecting their items. The process helped them to connect with school phase and it took 2-3 days time for him to get adjusted. Back home after his return, we found him excited talking about day's event in his school and busy reciting rhymes. Glad to see that he has embarked on this academic journey with excitement and confidence. Though I was relieved after seeing him getting adjusted so soon ... there was something which was bothering me still and what was that? Packing another tiffin box for school .... My elder one always had a request to send foods that are not much of a mess, easier to eat which will give him some time to play. I am sure there must be similar requests from most of the school going kids out there which force us to plan for recess snack ideas that's not just tasty, healthy, more appealing but quick and convenient for them to eat in their school environment. In the first week, I packed some dry snacks, finger foods, fruit pieces and a juice packet in their boxes. Both of them returned back with emtpy boxes. In the coming weeks, I have few healthy snack ideas such as parathas, rava idlis, dosas, chappati subzi that are approved by elder one and hope younger one too relish it. If any new recipe, I usually experiment it before packing it to school. This way I am assured that they would empty the boxes and there is no food wastage. 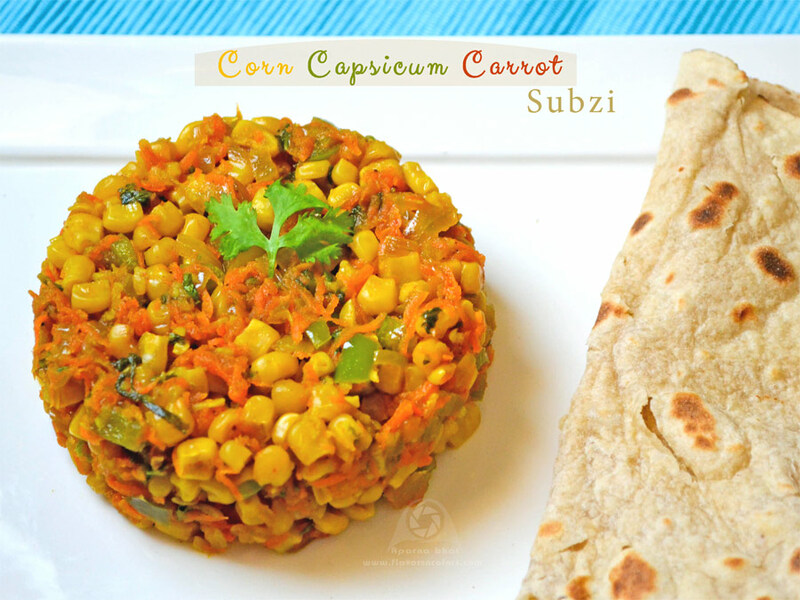 My kids love corn so when I came across corn subzi recipe in my notes, I decided to try it at home before sending it to school. I adapted the original recipe by adding capsi, carrots to make it colourful and more nutritious, and altered the quantity of spice powders to make it less spicy. Was happy to see plates polished off by both of them and a healthy recipe getting added to my tiffin ideas. If you too are in search of recipes for tiffin box do try the below recipe. Wash, rinse and drain the corn. Keep them aside. Heat oil in a pan. Add finely chopped onions and saute them till they turn light pink. Now add grated garlic and stir fry for a minute. 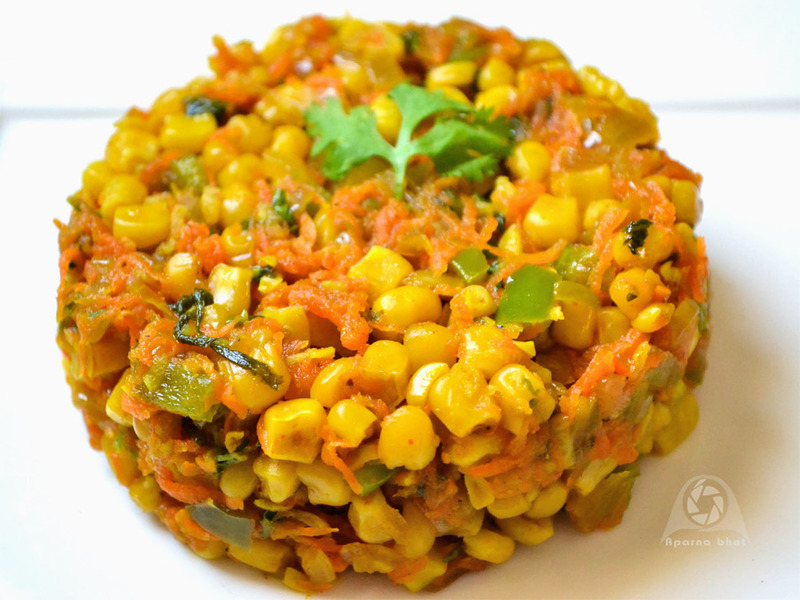 Add the corn, chopped capsicum and saute them on medium flame for few seconds. Add grated carrots, mix well and saute it. Mix it well. Add dry spice powders, simmer the flame and saute it for few seconds. Sprinkle some water [optional], add salt and cook it covered on low flame until done. Once done add finely chopped coriander leaves and squeeze in some lemon juice. Mix everything well and switch off the flame. Serve it with rotis/ phulkas. You can increase the spice levels to suit your tastes. You can also use this subzi as stuffing for sandwiches. Apply tomato ketchup on a slice of bread slice and cheese to another, stuff the subzi and toast them. Entering this recipe to this month's In My Veg Box event hosted by Tina of The Spicy Pear and run by Nayna of Citrus Spice UK and also linking this post to Flavor up with Spices # 2 - Cumin. Thank you for linking to this month's In My Veg Box event. I'm a big fan of kitchen king masala, think it add such a lovely flavour to many dishes. Very colourful and my kind of subzi..delicious. @ nandoos kitchen, Priya S, Karishma, Mireille .. many thnks for appreciation ... @Suja yes dear its great relief to see kids coming back home with empty boxes! I always have this problem with packing for kids box, this surely looks so healthy and very good option!